Sometimes getting good sound can be really tough – most especially if you have limited space. And it’s a shame, too, because often that means you’ll have to do without. It always made me feel let down to have to tell a customer that there simply wasn’t enough room to get good sound in their vehicle. I’ve never forgotten the look of disappointment on their face. This little power pack of sound is a modern-day solution to a decades old problem – getting great sound in a tight space. In my Alpine KTP-445U review I’ll provide a detailed an honest review of this fantastic like amp. You can find my final review score and pros & cons list at the end. First off, we need to set the stage by understanding what this little amplifier is and isn’t. It is not an end-all solution for the best audio quality money can buy. Let’s be realistic – you cannot get “perfect sound” in an incredibly tiny package for less than $150. When it comes to sound, there are always compromises that must be made. It’s important to have reasonable expectations. Any good engineer will tell you the same. Also, it’s important to remember that as I’ll be explaining below, this is a class D type of amplifier. Class D amps have several pros and cons to be aware of (which I cover in detail) and it’s important to remember this when you compare it to other amplifiers you may be considering purchasing. I’ll be reviewing it based on my extensive knowledge of the technology and the amp both as an engineer and an installer. Also I’ll be very fair – and very detailed – when I make comparisons to bigger and more expensive amplifiers. In case you haven’t noticed yet, I’m a big fan of this little guy – and very happy with what Alpine has come up with! I don’t normally expect much from miniaturized amplifiers, but in this case I can honestly say I’m impressed. In only the last several years class D audio amplifiers have become one of the hottest audio technologies in the audio world. This modern technology has improved greatly since the first class D amplifiers hit the market years ago. I’ve found that despite this many brands still leave a LOT to be desired. Unlike the KTP-445U I have been very disappointed by some I’ve tried. What is a class D car amp? Simply put, audio amplifiers are all based off on one or more basic “classes”, or fundamental types of designs. These range from Class A (the lowest distortion and best sound, but most expensive and biggest power hog) to Class B, and other variations similar to it. Until recent years, Class A/B amplifiers were the most common because they’re cost-effective, relatively simple in design, and don’t waste as much power as Class A designs do. Also A/B amps provide low distortion and high power levels for a good watt-per-dollar value. Despite their good points, conventional amplifiers waste a lot of electrical power which is turned into heat rather than power to drive speakers. Today’s amps are still somewhat bulky and heavy due to the large metal body needed to dissipate the heat created. A class D car amp is a newer type of amplifier technology used to produce power more efficiently. How do class D amps work? A Class D amplifier works by “modulating” (chopping up) the incoming audio signal and switching the transistors used to amplify it on and off incredibly quickly. This results in a fantastically efficient design without huge amounts of power being turned into heat like designs from the old days! Class D amplifiers are based on a switching circuit. This means the design modulates – or transforms – the incoming audio signal by chopping it up into a series of on-and-off waveforms. This is used to switch power-conducting transistors on and off thousands or hundreds of thousands of time per second. Older audio amplifiers (like class A or class A/B) conduct electricity nearly all the time they’re on. While A/B type amplifiers are about 65% or less efficient, Class D amplifiers can achieve an incredible 90% efficiency! 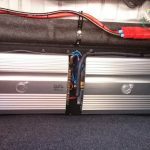 Because of this the actual amount of power being consumed by a Class D amp is greatly reduced – resulting in no need for a huge, bulky amplifier body or lots of heat being produced. This was a huge step forward in technology! Some bare-bones miniature D amps are smaller than a pack of cigarettes. Additionally, electronic component sizes have evolved to make these amps smaller and smaller. The decades-old problem of “How can I fit an amplifier into a tiny space in my vehicle?” is now just a bad memory. 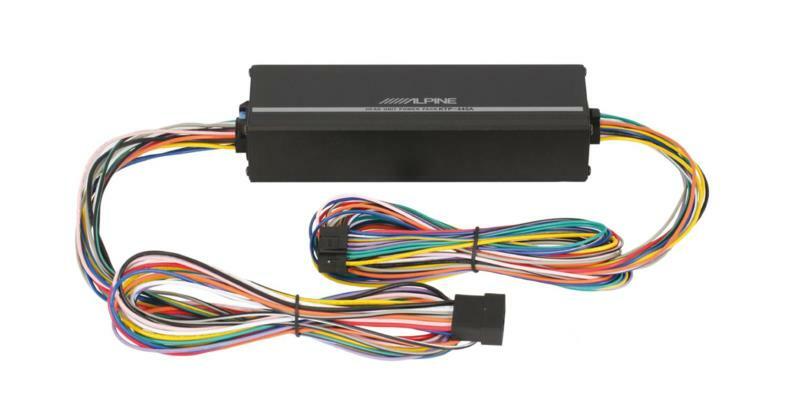 No longer do you just have to settle for a weak 15W per channel stereo head unit. You’re now able to get many times the sound in package that’s far smaller than anything imagined possible only 10 years ago. Something you might not be aware of is that there’s a lot of junk out there. Many of today’s car amp brands are no longer selling unique designs of their own. 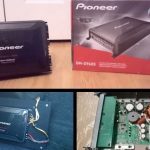 Sadly, many amplifiers on the market today, including compact Class D designs, are rebadged models that share the same internal components and mediocre design and only have minor cosmetic differences on the outside. Over the years, lower-end brands were bought out by larger companies and exist only for marketing purposes, not for quality. I’ve even bought one of these competing amps for test purposes (perhaps one day I’ll do a write-up) and was very disappointed with the design & sound quality. Noise levels were unacceptable and upon examining it I realized quickly it was another low-end version of an “amp on a chip” design. In the audio engineering world, this means shortcuts were taken at the expense of sound quality and performance. Alpine has relied on its great engineering resources and the KTP-445U is different from the competition because it’s an original and fresh design. I was not disappointed to find it has the trademark Alpine quality and innovation that became my personal favorite over the years. Also, Alpine doesn’t use misleading power ratings and specifications unlike other brands. The power ratings and sound quality specifications I’ll go into below are realistic and honest. This is important to me not just as an installer and an engineer, but because I need to be confident in anything I review and recommend. I know how it feels to spend your hard-earned money for products that disappoint. One of the biggest selling points is it’s size. The amp measures an amazingly compact 7 7/16″ x 1.5″ x 2.5″ (189 x 38.2 x 64.5 mm) in size. That’s smaller than pretty much any comparable amplifier available anywhere in the world today! I’m not kidding – I was expecting it to be much bigger. Basically all other high-quality Class D amplifiers below $200 today are at least 4 x the size of the Alpine. Hard to believe how small it is. An amp with comparable power only a handful of years ago would have been 5 x times bigger. This one is small enough to hold in your hand! Originally I had expected the amp to be a “plain Jane” amp with NO features whatsoever, but it turned out I was wrong. The amp actually, to my surprise, includes optional high-pass filters with selectable frequencies for the high-pass feature ( 60Hz, 80Hz, or 120Hz) to allow you to cutoff speaker-distorting bass frequencies if you like. Of course, you can always switch if off and run your speakers in “full range” mode if you like, but I normally prefer to block the lower bass frequencies. My custom-installed 6.5″ speakers can’t handle the lower bass frequencies (they don’t do well below 50 Hz or so, so 60Hz is pretty close) so that’s very important to me. Of course I didn’t expect the Alpine to disappoint, but again they’ve done a great job in the design. The amp can work with both aftermarket head units via the or RCA inputs OR speaker-level inputs from a factory stereo! In other words, you can use the KTP-445U to get more powerful and better sound even if you have a factory-installed stereo in your vehicle. 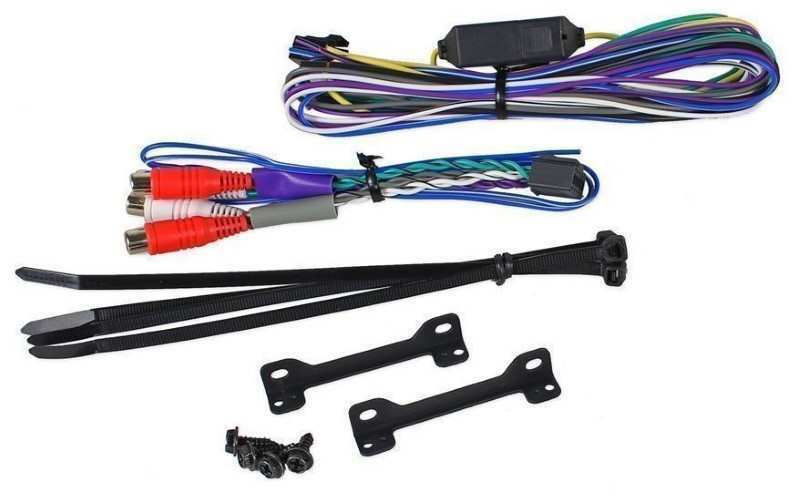 The included color-coded wiring harness makes it easy and it’s a feature I’m sure a lot of buyers just like you will appreciate. When adding an aftermarket amplifier to a factory system and connecting to speaker-level outputs, be sure to plan for getting some small-gauge speaker wire to reach the lengths needed to tap off of speaker wiring during installation. One thing I’ve learned over years of car stereo installation experience is that the ability to connect to factory-installed stereos is a huge plus. 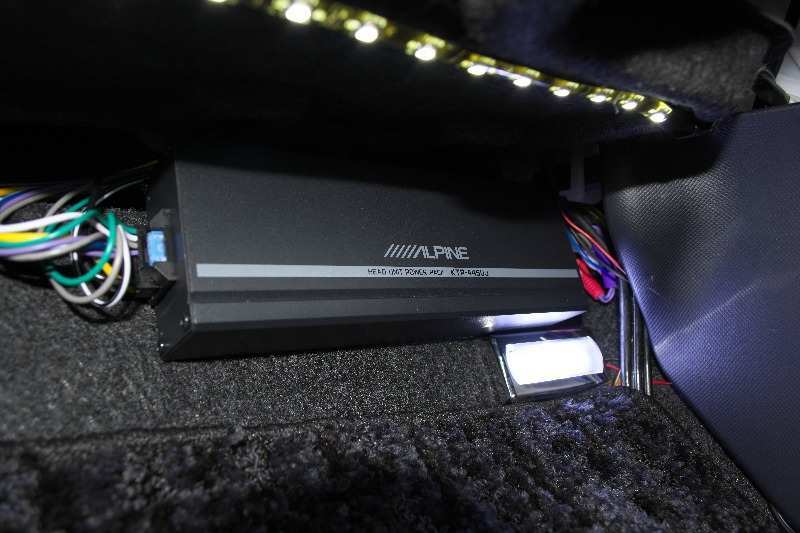 The Alpine can be connected directly to factory speaker wiring in order to “tap off” and get a good audio signal to feed into the amp. While not as good as being fed from an aftermarket head unit via the RCA inputs, it’s still a great option and in my experience, when done correctly, still sounds clean and there’s very little distortion or breaking up at higher volumes. 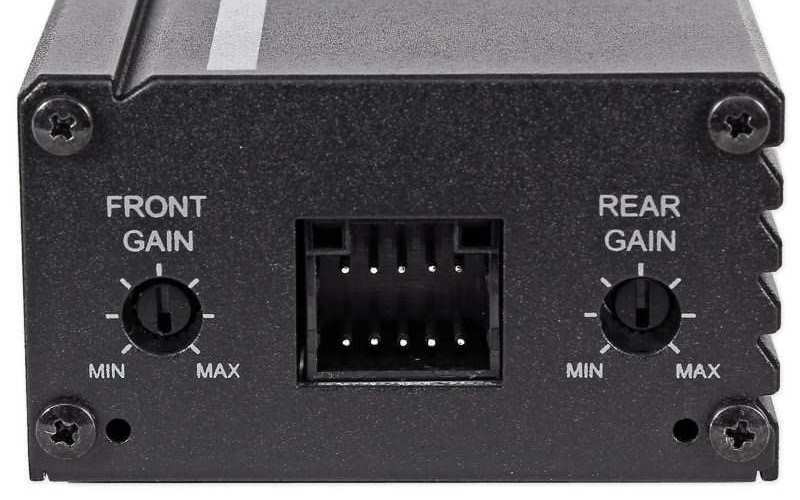 You can also disconnect the factory speakers once the KTP-445U is connected to avoid any distortion issues if that’s a concern for you. There are switches for audio controls on the bottom of the amp if you need to choose speaker level inputs or change crossover functions. As an added bonus, even if you’re using 4 speakers and only have a 2-channel input, the amp can provide a signal to all 4 outputs. You won’t have to buy a pair of RCA Y-adapters. In order to bridge the amp you’ll also need to set the 2/4 ch. input switch to 2 channel as well. Selectable option switches on the bottom of the amp allow you to adjust the crossover functions or split a stereo input into 4 channels. Also this is where you must select the audio source before powering up the amp. Separate front and rear gain controls allowing adjusting the amplification level depending upon the input signal strength you have. Speaker-level inputs, for example, might require turning it down, while RCA-level inputs may require boosting it a bit. It’s highly dependent upon what kind of stereo you have. In either case, it’s easy to adjust. The KTP-444U can accept up to 4V RCA inputs which is considered a “higher end” signal strength for aftermarket units. Not too much I have to say here – the front and rear controls are easy to use and easy to adjust. Also, the gain controls “feel” good because good quality components (potentiometers, which are just adjustable resistors) are used on the circuit board. This means that when you adjust the gain levels it won’t change over time and will have a good “feel” when you turn them. The amp can deliver up to 45 watts per channel into both 4 or 2-Ohm speakers, which is surprising because most miniature amps in my experience cannot handle 2 Ohm speakers. This means you could add extra speakers in parallel (to a degree) if desired. It’s important to understand that 45 watts isn’t enough for extreme sound levels or to drive large woofers if that’s your goal. This amp isn’t designed for that. I’d estimated with a good set of efficient speakers, however, you can get close to around 100dB of clear sound before it begins to give out due to its limits. For most people with normal listening habits, it’s plenty of power and you need not worry. As a reference, it may be helpful to know that most standard in-dash car stereo scan provide only around 15W-18W or so per channel of power. For me, sound quality is extremely important. It seems like every little bit of irritating distortion or poor musical reproduction I’ve heard really grates my nerves. I’m happy to report the KPT-445U has great good sound quality and is very impressive for a tiny amp! If you recall what I mentioned earlier, this is a Class D amplifier. The benefits of Class D amplifiers are fantastic size, great efficiency, and a lower weight, but one of the drawbacks is reduced sound quality. I can say with certainty (and don’t just trust me on this – check the multitudes of other happy reviews) that the sound quality is very good. Remember when I mentioned earlier about how I bought another brand of car amplifier and was disappointed? It was because the noise levels (the noise I heard when no music was playing) was far too high compared to the many amplifiers I’ve installed and listened to over the years. Not so with Alpine – they’ve done a great job in minimizing noise. I can say I was pleasantly surprised. I came into my review of the KTP-445U expecting an “ok” experience but was honestly very impressed with what Alpine has done. In order to ensure that Alpine sound quality is heard at your ears, we’ve created a platform that offers an unbelievably low noise floor, taking extra care to ensure a clean signal path, with no extraneous interference. The end result: The Power Pack boasts 1 Watt Signal-to-Noise Ratio of 82dB or better. In my opinion this says a lot. Why? Because it takes additional engineering time and manpower – in addition to planning – to make the effort to make better sound quality a design goal rather than a forgotten number on a spec sheet somewhere. I’d much rather pay a bit more for something I know is designed right from the beginning and I know sounds great rather than just made to be “ok” and barely passable. If you have to increase the gain level greatly it also greatly increases your chance of hearing the base noise level in any amplifier, including this one. For best results, the amp will be connected to a good, strong signal and the gain can be turned down, resulting in the cleanest output possible. And by the way, for you spec nerds like me, the specs on this little amp are great. According to the company the Power Pack distortion actually decreases at higher frequencies, resulting in a clean and clear signal where your ear is most sensitive to distortion (less than 0.03% THD+N @ 1W, 1% THD+N at rated power). Note: the KTP-445U mini amp – despite its tiny size and simple design can drive 2 ohm speakers up to 45 watts each. I was honestly impressed and didn’t expect that. Great for installation under seats and just about any small space you can think of. The great thing about the size is that you can fit it in incredibly small spaces which were unheard of years ago. A great example is some of today’s vehicles in which there’s extremely tight space inside the dashboard, perhaps besides or behind the current stereo. It’s a great solution to the most difficult installation problems which years ago would have required either a ton more money to be spent by customers or unfortunately cause some people to just “give up’ as there weren’t any other options. It’s also a great fit for boats as well but you’d need to ensure it is protected against corrosion and exposure to the air and salt water since it’s not marine rated. You can mount the tiny powerhouse by using the included zip cable ties to attach it to the nearest available wiring or mount it permanently using the included brackets and self-tapping screws. Don’t forget that because of its light weight you could also use double-sided adhesive tape or Velcro if desired for convenience. Note: Because it is so efficient and draws less electrical current than traditional amps, you won’t need to get a heavy-gauge wire installation kit and run extra wire. It’s possible to connect it to a nearby 12V supply from your car stereo, for example. Need more power? Amazingly – and to my surprise – it’s not a problem with this amp. Just switch the 2/4 channel input switch to the 2 ch. input mode. Then connect the output speaker wiring in bridged mode and you’re done! You’ll have 90W RMS per channel of high-quality sound at your disposal. Honestly, I didn’t expect that for an amp so small, but once again the engineering quality made all the difference. Just one more reason I’m impressed with it. The KTP-445A looks very similar to the KTP-445U. However, it’s designed specifically for Alpine head units 2005 and later, not for RCA or high-level inputs from others. When shopping it’s important to be aware of the KTP-445A model as it can cause a bit of confusion and comes up in search results. 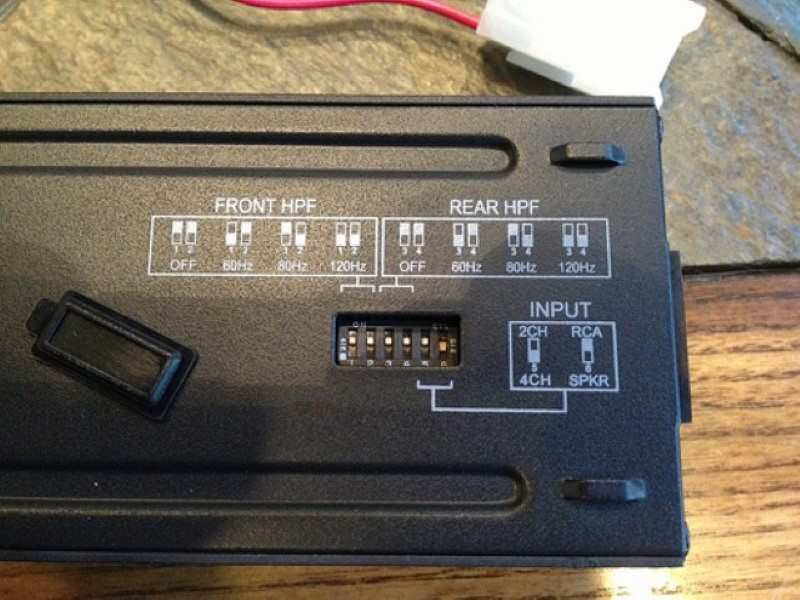 The KTP-445A is a model of the KTP-445U (where “U” stands for universal; “A” stands for Alpine head units) designed only to work with Alpine model car stereos. The wiring harnesses included don’t allow using RCA connectors and the standard speaker-level inputs. Aside from that, both share the same basic design and performance. I would have liked to have an optional low-pass crossover feature in addition to the high pass design. Perhaps it was a cost-cutting or design compromise decision that had them remove it. I’m not sure. I have somewhat mixed feelings regarding the location of the switches used to control sound options. They’re located on the bottom, whereas ideally they’d be accessible from the side or top. But ultimately that’s a minor complaint. All in all, in my opinion the KTP-445U is a wonderful little 4-channel amplifier with great sound quality. It’s truly a dream come true if you want great sound but have especially limited space. It’s not for those need extreme power and volume levels. You can’t drive subwoofers or very high-volume speaker systems with this amp, but what it does it does well! Head over to check out the current price and see the fantastic buyer reviews at Amazon. A well-designed and great sounding miniature car amplifier. One of the best compact amps I've seen. Alpine has done it again with their approach to getting the most power and sound out of a tiny package. It's a great upgrade for weak aftermarket or factory stereos. Thanks to its design it's a great general purpose 4-channel amp that can fit a wide variety of installation and audio system needs. You're paying a few extra dollars for better sound and a better design - and that's exactly what you'll get. You won't be disappointed. 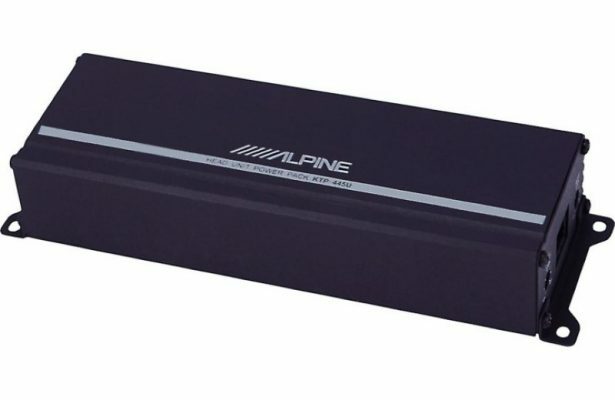 Just curious, Alpine’s website says it can be bridge for 90 watts rms x 2. Hi there – you’re right. Somehow I made an error – it is bridgeable to 2 x 90W RMS. I’m not sure how I missed that. I’ve updated my post to correct this. I am very interested in this amp for my 2008 gl1800 goldwing. Just trying to figure out the best front 6.5″ and rear 5″ to replace stock speakers. Any suggestions? Also what would be the next upgrade for a amp? I do have concerns about the heat buildup with amp mounted in the small trunk. Hi Bruce! I am very sorry about replying late to your comment & questions. Unfortunately I wasn’t feeling well at all yesterday so I couldn’t reply sooner. 1. For the front 6.5″, I recommend a plastic cone pair of great-sounding coaxial speakers. Unlike paper cone speakers, they’re a lot more resistant to moisture. Additionally, these are pretty efficient (produce a good volume for the power applied) which is important for motorcyles. Have a look at these great Polk Audio DXi651 coaxial speakers. For the 5″, see my comments etc below. 2. Regarding the amp, what are you currently using, and how much room do you have for an amp? My advice would to get an amp with no less than 45-50W per channel. The Alpine KTP-445U is a very nice amp and you can bridge it to get 90W/channel if you wanted to run only the front. However, you can get pretty good volume and sound with what it provides. 3. With an amp like the KTP445U, there’s nothing to worry about with regard to heat. Class D amps (especially this one) run very cool and won’t have heat problems. Regarding the 5″ speakers, do you have any speaker opening measurements? 5″ isn’t a standard size, so most likely you’ll need to use 5 1/4″ or 4″ speakers with adapters to fit. But it’s important to know the mounting hole size before I can say more. I checked online but so far came up short in finding the specs for your model Goldwing. I hope this helps – just post a reply and we’ll go from there. Thanks for the comment, and for stopping by! NOTE: You might also considering stuffing some Polyfill (polyester pillow stuffing material, sold by the bag) behind the speakers to get the best sound. The more you block off the rear of the speakers, the better. Speakers open to the air or without a decent sealed enclosure have fairly bad sound and will reach distortion levels too soon. Oh man, I just typed a whole page of information and did not put in Name and email before submit. Lost everything. OK condensed version. Called Alpine Tech line three times. Two said no go to add KTP445U to existing system. One said yes. Until I heard that I was going to keep stock amp and cut in a KTP445U for the new front speakers bridged and a KTP445U bridged for the new rear speakers. 2. Stock amp on goldwing 60×4 watts. Powerful yes but I want more. Located above rear tire. Would prefer not to remove and replace but time will tell. Would rather add the new amp or amps. Plenty of room for almost any size amp. Three different large storage compartments. Problem is cooling. 3. yes probably 5 1/4s Suggestions for nice ones? Note. Will do on turkey stuffing. Marty. Thank you for your time, I really appreciate it. I am linking this information to my followers on the gl1800 website. Hi again, Bruce. I checked out the video, but he’s incorrect. There may be a few exceptions but his statement doesn’t make sense especially given that this is a “universal” amp. One reason I say that is because aftermarket amps are very frequently used to replace, or are added alongside, factory amplifiers. There are some cases where it’s not possible for a variety of reasons, but that’s usually not the case. I’ve installed quite a few in both situations. As long as you have access to the factory amp’s wiring it shouldn’t be too hard adding the Alpine and leaving the original there if you don’t want to remove it. I have tapped off of factory amp wiring (audio signal and power wiring, too) for this very reason by stripping the original wiring and soldering the other amp’s wiring to it. This avoided cutting up the original wiring. In the case of the KTP445U, you won’t need large gauge wire, so that makes it even easier. For the 5.25″ speakers, have a look at these water & moisture resistant Polk DB522 speakers. They’re recommended for motorcycles as well. Thanks for following up and I do hope this information will help others as well! All right then. So if I leave the stock amp where it is and just cut the wires at each stock speaker (wiring that in to input signal to the amp) and a new set of wires going from the output to the new speakers I should be OK. Using the speakers you suggested, would I want to use 1 or 2 Alpine KTP-445U or a completely different amp? Also, how do you make money off this info? Sell stereo equipment or ?? I do not expect this valuable information for free. Ideally you would be able to unplug the connectors to the factory amp (unless you’re still using it for some speakers) and cut the original wiring as you said. Then connect to the amp. Of course, be sure to tape off the bare ends of the speaker wiring from the amp if it’s still powered on to prevent shorts. The good thing is you have some nice flexibility with the Alpine. You can leave it as-is and get 45W RMS to each of 4 speakers, or you can bridge it for more power and volume to each (90W x 2 when bridged). If you’re happy with the factory amp’s volume, if it were me I would try 1 amp first and see what you think. One reason I say that is because the factory amps are not usually rated accurately, so the KTP445U will likely be more powerful than the factory one. The Polk speakers are fairly efficient (produce good sound volume per wattage) so that should also help the volume you’ll get. I have an affiliate disclaimer at the bottom of my site, to be upfront about this way of earning money. My pleasure, I’m happy to help! Let me know if anything else comes up. Those Goldwings are really nice and I’ve always thought they were cool. Just was wondering on your thoughts on alpine PSS-23WRA . Just got a 2018 Jeep JL. And want a better sound . 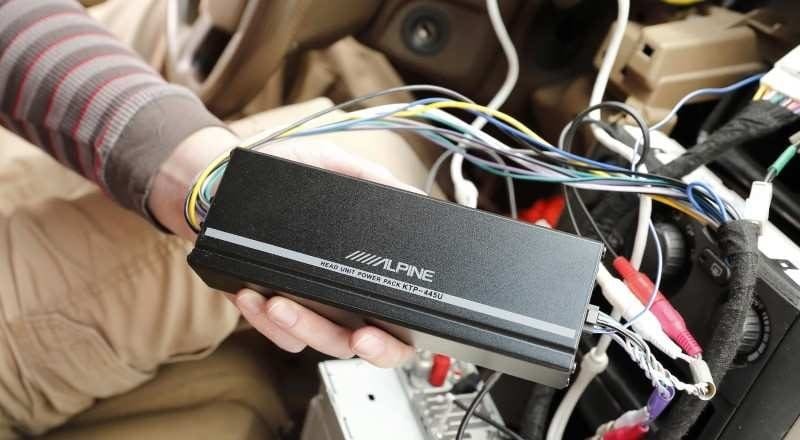 I like alpines plug and play system for jeep.and sub and amp under seat . Or price wise , do you think I should do something eles, ? Hi Alan & thanks for dropping by. I took a look at the PSS-23WRA. I am familiar with the 8″ PWE-S8 powered sub it includes. In my opinion the cost for the system is far too high and if you don’t mind less installation convenience you could get much better results for a fraction of the cost. – Preferably a real subwoofer in a ported or sealed enclosure. While you could bridge 2 of the 4 channel amp’s outputs, a second mono amp would be much better to drive it. 10″ or 12″ would do well. Another great option would be to use a powered subwoofer like this nice Rockville 12″ with the amp built in. In either case, using straps or brackets to hold the box in place in the cargo area should work. If you go this route you can easily save 1/2 the cost vs the Alpine and get much better sound. 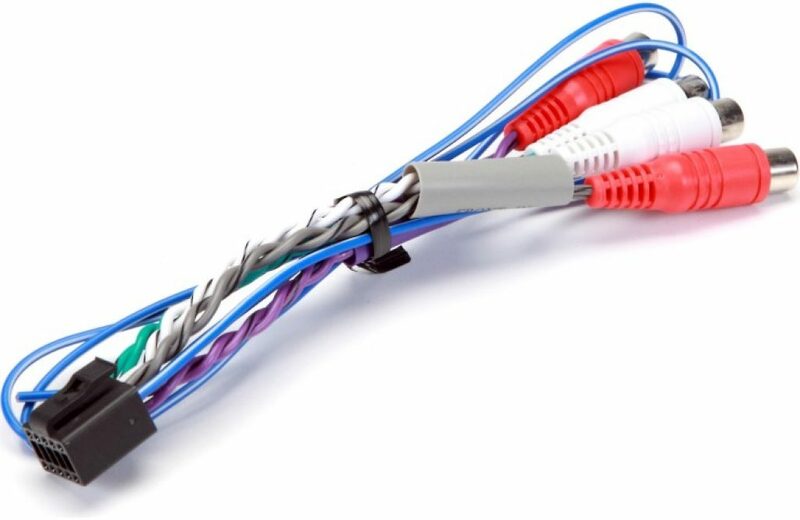 The tradeoff is that’s it’s not super-convenient like the PSS-23WRA’s ready-made connectors and brackets. Therefore installation takes more time and effort. 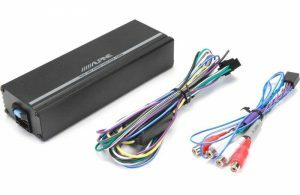 If theft is a concern for the subwoofer, in the install shop we used quick-disconnect connectors for the subwoofer box wiring so it can be removed easily and avoid the temptation for thieves.